Sharing knowledge is the way to go! If you had asked me anything about hair care / hair oils / shampoos etc 8 months back, I would have had no idea about it. For the last few months, I have been on a quest to educate myself and learn whatever I can, whenever I can. The best place to learn is of course the internet, but I always verify the authority of the resource that I am learning from and almost always check at least 2-3 other resources to have a broader outlook. The direct impact of this learning / research is that I am able to understand my product better and in turn this helps me create a better product. There is a saying that “knowledge grows when you share” and I completely believe in it and that is one of the reasons I have recently been active on Quora as well. Quora allows me not just share my knowledge but also read from other peoples experiences and gain better understanding of a topic. When I answer a question, I try to explain the reason / science behind my answer as well so that people reading it know why they have to do something, instead of someone just tell them to do it. 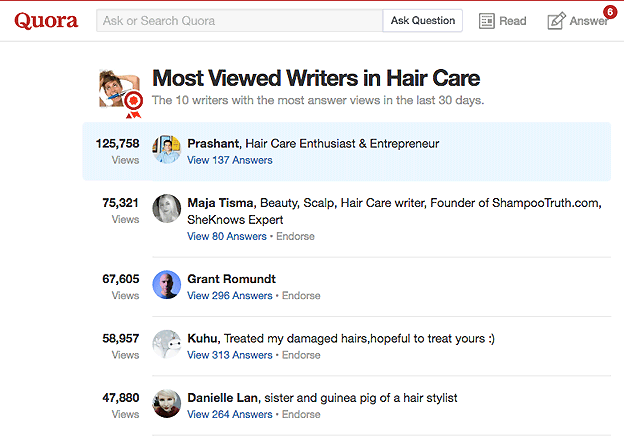 Thanks to the awesome response which I have received on Quora, I am not the #1 Most viewed Writer in Hair Care.